The 2019 Aus Championship is to be held at Royal Yacht Club of Tasmania From January 1-8, 2019. Having hosted the Class World Championship in January this year at Fremantle, there was less enthusiasm from Australian Teams to travel to the East Coast of the USA for another World Championship so soon. However 4 teams from Australia made the long trek to Newport Rhode Island. The teams were: Otto Henry / Tom Larkings, Ryan Littlechild / Jack Ferguson, Cole Tapper / Tyler Creevey - all racing in the Open Fleet - and Lucy Gray / Chloe Harper racing in the Ladies' Fleet. VERY light winds greeted the fleets for all racing except the final day. 2 Teams made it through to the Gold Fleet finals - Henry/Larkings and Littlechild/Ferguson. Henry/Larkings, in their first regatta together, struggled all week from being too heavy but with one race to go were still placed on the podium. An unfortunate capsize while leading the final and only windy race of the regatta pushed them from 2nd to 6th overall. Littlechild/Ferguson put some good races onto the scoreboard but in their first season together lacked the consistency required to move up the ladder in the extremely tough Gold Fleet. Many valuable lessons learned by these guys which will pay dividends in the coming years. 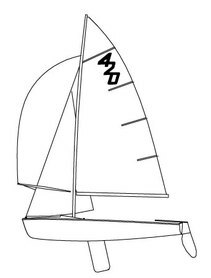 The 2017 Australian 420 Championship was held in Adelaide at Brighton & Seacliff Yacht Club from 2nd to 8th of January. 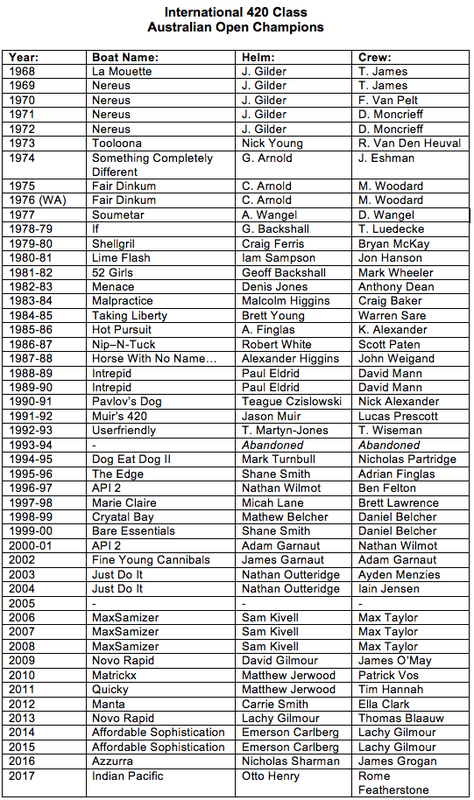 The Australian Championship has no age limit and the ages of competitors ranged from 14 through to 24. Please click here for the results. The Australian Youth Championship was held in Adelaide at Adelaide Sailing club from the 10th-14th January. This regatta is open to competitors aged 18 or less at 31.12.17. Please click here for results. Check out this awesome video of the 2015 Australian International 420 Class National Championships at Fremantle Sailing Club. This video was prepared by Ben Hartnett of Sailing Shack for the Australian International 420 Class Association to share the fun of 420 sailing and the wonderful sailing conditions at Freo! 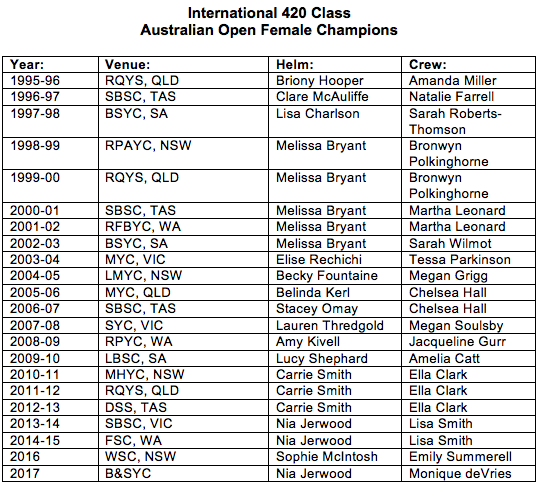 Click here to download a complete list of the winners of the Australian International 420 Open Championship from 1968 to 2017 and the Australian International 420 Open Female Championships from 1995 to 2017.